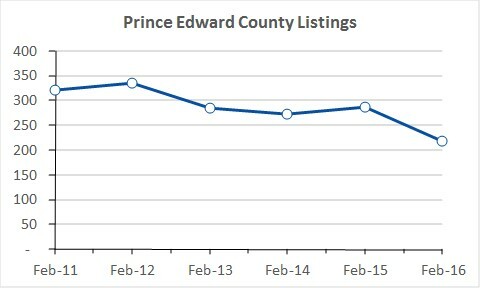 Following in the pattern established in January, the inventory of real estate listings available for sale in Prince Edward County remained at 5-year low levels in February as shown below. Home sales in the County were off 10% in February compared to a year earlier, but listings were down even more at 25% compared to a year earlier. It would appear that there’s no loss of appetite on the part of buyers, but that the shortage of homes available led to the February decline in sales. There are other February statistics which show that buyer demand is still strong. I’ll cover these in later posts.